Working across photography and sculpture, Michael Queenland examines the relationships between images, objects, and language. Often utilizing found objects that he has accumulated, altered, or translated into another material, the artist blurs the boundaries between artifacts and art. In 2012, Queenland created a sprawling site-specific sculptural installation titled Rudy’s Ramp of Remainders composed of various goods, such as newspapers, Afghan war rugs, plumbing pipes, and perishable foodstuffs, including an assortment of cereals. 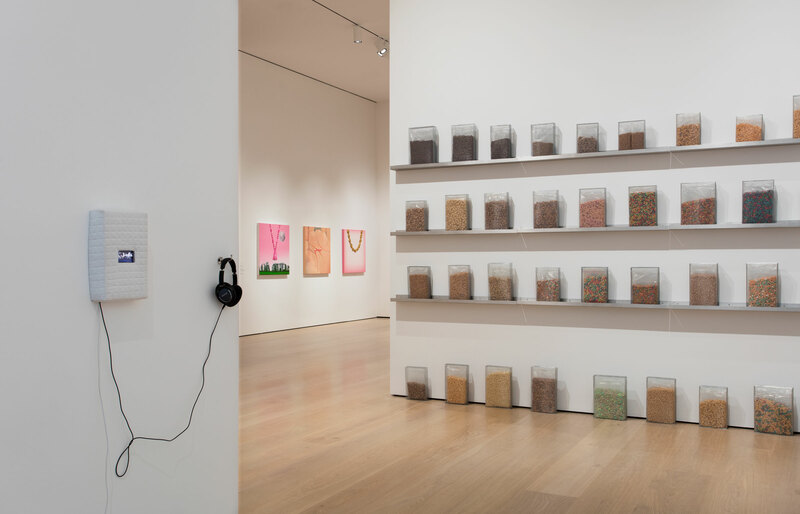 The assemblage asked viewers to consider the diverse formal, social, and political associations inherent in everyday materials, as well as the nature of consumption and the means of distributing resources and information. The inclusion of cereal boxes pointed to the ways product design traffics in status and desire. The prevalence of silly cartoon characters, physically formidable athletes, and images of wholesome ingredients across the boxes offered a study of contemporary archetypes, ideals, and indulgences. For Made in L.A. 2018, Queenland revisits the highly processed cereals that were part of this earlier installation. 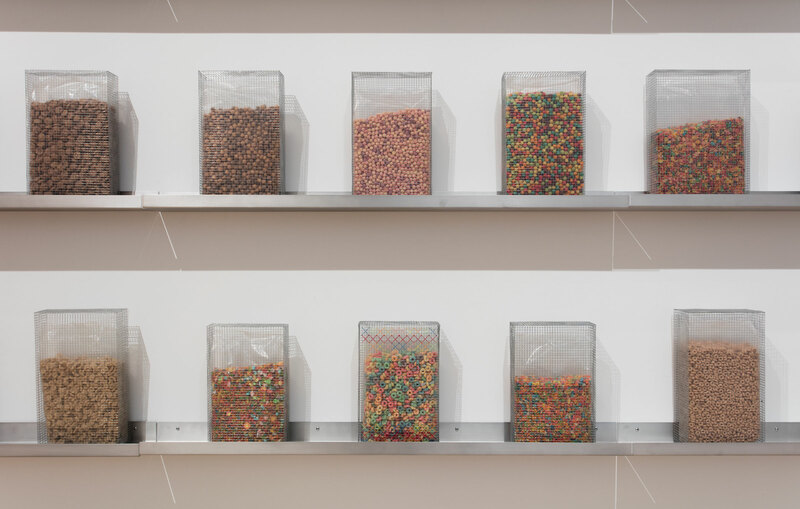 For Cereals for space migration, the bags of grains are stripped of their cardboard boxes and inserted into metal mesh containers whose transparency serves to highlight their artificial shapes and preternatural colors. The work’s title, coupled with the choice of display, suggests the type of retail space we might encounter in the future, one being ushered in by the commercialization of interplanetary travel. 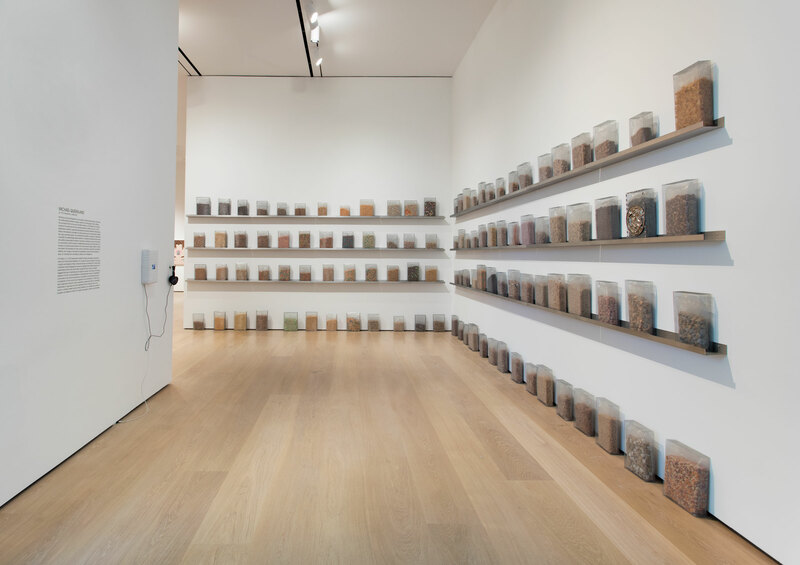 The installation comments on the drive toward space colonization and its attendant lack of consideration of the myriad ways migration and colonization on Earth have been destructive forces for many populations. Queenland links our estranged relationship to agriculture and the ingredients that comprise many of our foods to a shared anxiety about survival, pressing us to consider how notions of progress can distance us from our origins, languages, customs, and identities. Michael Queenland (b. 1970, Pasadena, California) works in the East Hollywood neighborhood of Los Angeles. Queenland earned his BA in English literature, in 1992, and MFA at University of California, Los Angeles, in 2002. His work has been shown in solo and group exhibitions at Kristina Kite Gallery, Los Angeles (2017); Hammer Museum, Los Angeles (2017); Santa Monica Museum of Art, California (2012); Whitney Biennial, New York (2008); LAXART, Los Angeles (2007); Harris Lieberman, New York (2007); Institute of Contemporary Art at the Maine College of Art, Portland (2005); and Massachusetts College of Art and Design, Boston (2005), among others. He is a recipient of numerous awards, including the Rome Prize (2016–17), American Academy in Berlin Fellowship (2009), United States Artist Award (2006), and Helena Rubenstein Foundation Fellowship award for Studio Museum in Harlem (2004–5). He was assistant professor of sculpture at the Yale School of Art from 2010 to 2016.